After I registered the children for school in our new town, I received the school supply lists. Supply items may need to be replenished throughout the school year. 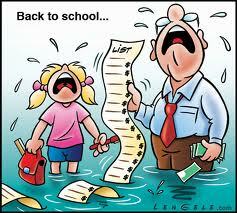 There may be a few additional individual class needs that will be addressed the first week of school. These are the school supply lists for my two children. This was a shocker for me. My daughter had gone to a daycare with a kindergarten program so the only things I ever brought in were used paper towel rolls, egg cartons and the containers for clorox wipes. My son’s school basically required 5 spiral notebooks, 5 folders, and some pencils with erasers. The school supplied everything else. I have to wonder about all this. I can understand requiring pens, pencils, notebooks (not why I have to get a particular BRAND of notebook), erasers, a box to put these things in, paper, etc. These all seem like normal schools supplies. But why do I need to bring in tissues, boxes of ziploc bags, wipes, and hand sanitizer. I also do not want my kids to use hand sanitizer since it kills the good bacteria. If their hands are dirty, send them to a sink to wash them or give them a wipe. What’s scary is that even with all of this, teachers are still spending out of pocket to buy supplies, which is pretty sad. I also have to ask: How complicated has 7th grade math become that the children need a $100 calculator? Granted I was really bad at math, but I got through high school and a semester of college math and never used a calculator. I’ve also heard that on the 1st day, you get a list of “requested” supplies from the teacher, and my sweet guy’s list actually hints at that. However, I will be batshit if this is true. How much more crap do I need to get? We live in a not cheap neighbor hood and pay not low taxes and yet I am being asked to supply tissues and wipes. What’s next, will I asked to bring in toilet paper and paper towels. 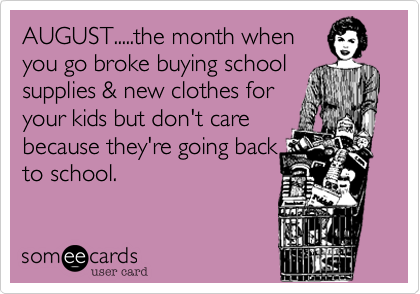 And of course, since school has not actually started I have not gotten the fundraising catalogs yet. Since this is new for me, I have to ask, is this typical? Is this a small list and I should be grateful, or is this alot. However, no matter how crazy the list, I still love this commercial. My son’s list for 4th grade is comparable. On day 1, I expect to be asked for 2 boxes of tissues. We will also get asked for other random things through the year, as well as, of course, the fundraising! Ooh. I forgot. Plus a new backpack, a new lunchbag, new indoor sneakers, and new outdoor sneakers. Maybe they require specific brands to keep every child on an even playing field. Most schools don’t supply tissues anymore. Years ago, the teacher supplied the tissues and miscellaneous supplies. That gets expensive. A $100 calculator is a bit much. Kids tend to misplace them. Hopefully public schools won’t have a lot of fund raisers. Good luck!